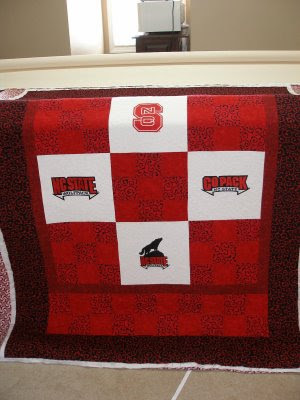 Thread Waggle Quilting: Go State? 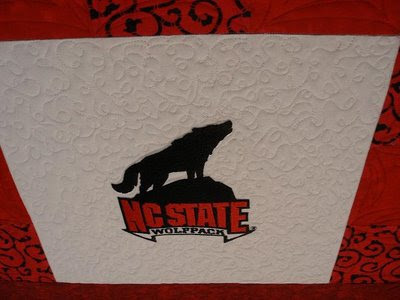 Yes, I know that it is UNC in the NCAA finals tonight, but I have not made a UNC quilt and I just finished quilting a NC State quilt so I thought I would share it. At market last fall there was a company that sells kits college quilts. My mom and I made a Florida State quilt for my brother-in-law, a Georgia Tech quilt for Matt and I decided to get this NC State kit as well. The kits are neat because you get the fabric for the top and the embroidery is already done for you. 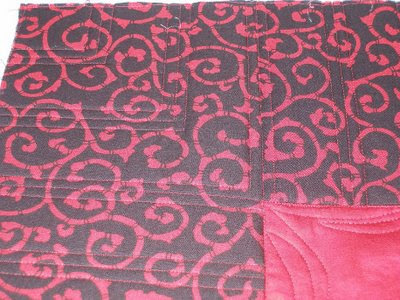 I had seen a quilt on the APQS forum which the quilter had done piano keys in the border and then had done the corner like the picture below. My Millie has vertical and horizontal channel locks that made this quick and extremely easy. I really like the way the corners turned out. I have been playing with different ways that I can do line dancing. I have taken up doodling on post it notes. 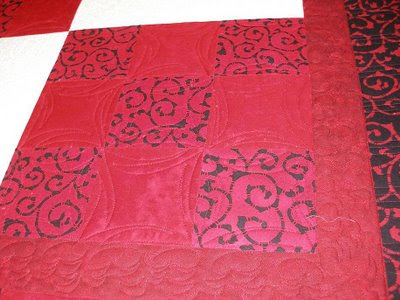 In my last post I showed a border that I had done a Sue Patten design on. Believe it or not this is the same design in the 2 inch red border. This is my first attempt at micro-whimsy. Whimsy is my favorite, fast all over freehand design because you can throw so many different shapes into it to add interest. Mom is out of her comfort zone.